In the past decade or so, robo-advisors have been taking business from traditional brokerages. In order to keep up, brokerages like TD Ameritrade have begun to offer automated portfolios that compete with robo-advisor services. Essential Portfolios is the automatically managed, online portfolio offering from TD Ameritrade. It is a relatively new service that’s still in development, but it is a solid choice for someone who wants fully automated portfolio. Looking for more than just an automated portfolio? TD Ameritrade offers other trading and investing options for competitive fees. You can also feel comfortable knowing that your money is being held by a reputable company. Pricing: How Much Does TD Ameritrade Essential Portfolios Cost? TD Ameritrade Essential Portfolios is meant to give you a simple and affordable robo-advisor option. There is no cost to open an account and its mobile apps are also free. There is only one management fee of 0.30% no matter how much you invest. This fee is competitive with other brokers and robo-advisors. The minimum deposit for an account is $5,000. The ETFs in your account will charge you fees but their expense ratios are between 0.06% and 0.08%. That’s low. Many other robo-advisors have an average ETF expense ratio closer to 0.15%. There is one other fee to keep in mind. If you want to completely transfer your funds out of an Essential Portfolios account and you have less than $100,000 in your account, you will pay a fee of $75. One advantage of Essential Portfolios is that TD Ameritrade allows you to do more than just invest in a portfolio. You can also trade or invest in stocks, bonds, mutual funds, certificates of deposit (CDs) and ETFs separate from what’s in your portfolio. If you want to do any trading, there's one flat-rate commission of $6.95 per equity trade. If you have read about any other robo-advisors, TD Ameritrade's process will likely be familiar to you. The first step is to answer a questionnaire. The questions will help TD Ameritrade to understand your financial situation, your investing goals and your rick tolerance. This questionnaire is unique in its thoroughness. Many robo-advisors ask a few questions that take you a minute or two to answer. This is easy for customers but it’s hard to get a complete picture of someone’s finances in a couple of minutes. TD Ameritrade’s questions will take you slightly longer to answer (less than 15 minutes) because it asks more directed questions. Instead of just asking you how much you want to save, it will ask you when you plan to withdraw your savings and how you plan to use them. Someone may want to save $100,000 over the next 40 years, but may also know that they’ll need to withdraw savings for various expenses along the way. Things like this are taken into account when your portfolio is created. After going through the questionnaire, you will get a portfolio tailored to you. Your portfolio will consist of cash and ETFs from five asset classes. These asset classes are: U.S. equities, international developed equities, emerging markets equities, U.S. bonds and non-U.S. bonds. The majority of robo-advisors offer more than five asset classes with some offering as many as 20. However, true to its name, this portfolio is just designed to cover the essentials. The ETFs, which are from Vanguard and BlackRock’s iShares, will have expense ratios in the range of 0.06% - 0.08%. This is significantly lower than some robo-advisors. One point that TD Ameritrade emphasizes is that the ETFs it uses are all non-proprietary funds that were recommended by a reputable third party (Morningstar Investment Management). Some robo-advisors, particularly those from brokerages, use ETFs they created themselves. When you invest in one of those funds, the brokerage earns a little extra money. There is a concern with some advisors that their recommendations are biased. This is especially a concern since robo-advisors usually make trades automatically on your behalf without giving you the opportunity to select different funds to invest in. TD Ameritrade shows that it has your best interests in mind by choosing the best available ETFs instead of ones it created. TD Ameritrade Essential Portfolios offers many account types. There are traditional IRAs, Roth IRAs, rollover IRAs, SEP-IRAs, solo 401(k)s and solo Roth 401(k)s. You can save for college with 529 plans, Coverdell ESAs and UTMA/UGMA accounts. There are individual accounts, joint accounts and trusts. One thing to note is that there are multiple business account options. Very few robo-advisors offer business accounts. The takeaway here is that TD Ameritrade offers a lot of account types. If you want something, it’s probably offered. TD Ameritrade Essential Portfolios offers automatic rebalancing of your portfolio and automatic deposits at no additional cost. Automatic rebalancing ensures that ETFs in your portfolio stay in the proper proportions for you to meet your goals. You also don’t have to worry about meeting or talking with an advisor because rebalancing is handled automatically by software. TD Ameritrade is about more than just robo-advising. It is also a brokerage that handles hundreds of thousands of transactions each day. With an Essential Portfolios account, you have access to TD Ameritrade’s brokerage services. Do you want to trade individual stocks? Do you want to invest in mutual funds or ETFs that aren’t in your portfolio? You can do all of that for a commission of just $6.95 per equity trade. This is a flat-rate fee and is competitive with other brokers and trading platforms. It’s natural that at some point, you’re going to need help from customer service. A TD Ameritrade Essential Portfolios account gives you 24/7 customer support by phone, online live chat or email. TD Ameritrade also has over 100 physical locations across the country that you can visit for help. This robo-advisor is for the average investor who wants a bare-bones, hands-off portfolio. The fees are competitive with other robo-advisors. The minimum deposit of $5,000 will be high for some people but it is more accessible than the minimums for some other robo-advisors. You never have to worry about scheduling meetings or phone calls with a human advisor. Once you create your personalized portfolio, everything is handled automatically online. You aren’t burdened with making every decision for your portfolio. People who already have TD Ameritrade accounts will benefit because they can now get the benefits of a robo-advisor in addition to the other services they get from TD Ameritrade. If you are new to investing, TD Ameritrade offers great articles and videos to help you learn everything you need to know. An Essential Portfolios account is free to create just like other accounts with TD Ameritrade. When you go to open an account through the website, you will have to answer some questions about your finances, your investing goals and your risk tolerance. This questionnaire is a bit longer than other robo-advisors (it shouldn’t take you more than 15 minutes) but it helps the company to get a more complete picture of you. After the questions, you will get a recommended portfolio. At this point, you will see a very useful tool: a chart that shows you projections of how your recommended portfolio will perform. Can you actually meet your goals based on the information you provided? This tool is great for giving you realistic expectations right from the start. 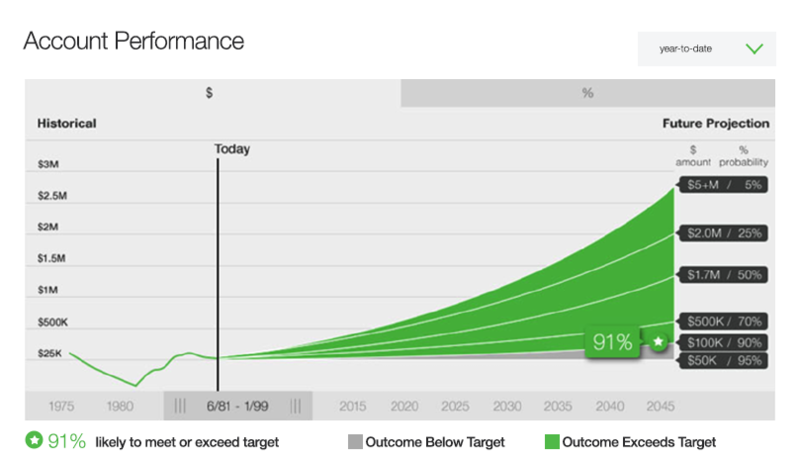 You can also change your risk level to see how your projected earnings would change. There are five possible risk levels that range from conservative to aggressive. Most people will get a recommended portfolio with moderate risk and it’s actually unlikely that TD Ameritrade will recommend the most conservative risk level. This makes sense because very conservative portfolios won’t give you many returns, but make sure to manually set your risk if you know for sure that want a conservative portfolio. This might include people who are close to retirement or already retired. Once you’ve looked over the recommendations, you can create your account and transfer money. You will need to deposit at least the $5,000 minimum before you can start investing in your portfolio. This is a bare-bones robo-advisor. Its portfolios only consist of five asset classes. This may be enough to keep your investments diversified, but other robo-advisors have more classes. In general, a robo-advisor will have about 10 asset classes to choose from and some even have over 20. There are no tax-saving features like tax-loss harvesting. Tax-loss harvesting is very common among robo-advisors. Some may only offer it to accountholders above a certain asset threshold but it’s completely absent from TD Ameritrade Essential Portfolios. If you are investing in taxable accounts, features like tax-loss harvesting can potentially save you a lot of money. The annual management fee of 0.30% is competitive with other robo-advisors but it is certainly possible to find cheaper options. The minimum deposit of $5,000 is also high for some people. A number of robo-advisors let you start investing with a lower minimum or with no minimum at all. 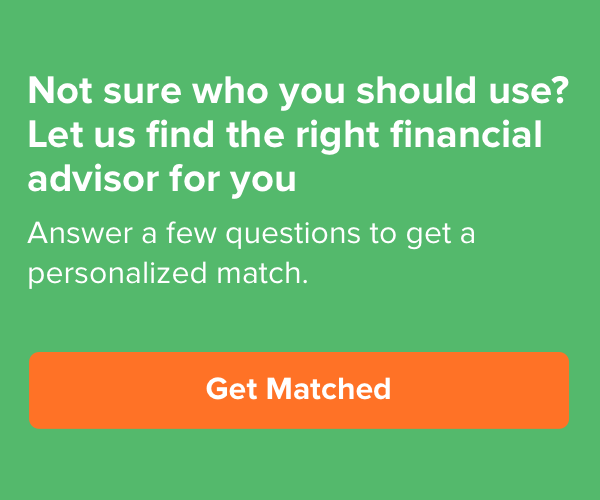 This robo-advisor isn’t the best choice if you prefer access to human advisors. Some robo-advisors offer part- or full-time access to human financial advisors, but this one is completely online and automated. You have 24/7 access to customer support but this isn’t meant to be a source of financial advice. Competition: How TD Ameritrade Essential Portfolios Stacks Up? TD Ameritrade Essential Portfolios requires $5,000 to start investing. This minimum isn’t the cheapest but it is also significantly lower than robo-advisors from other brokerages. Vanguard, which is another brokerage that recently began offering robo-advisor accounts, has a minimum of $50,000. However, Vanguard offers some tax-loss harvesting and access to human advisors. The annual management fee with Vanguard is the same as TD Ameritrade Essential Portfolio at 0.30%. A management fee of 0.30% is competitive but not the lowest available. Wealthfront charges a flat-rate management fee of 0.25%. For that fee you also get tax-loss harvesting and daily rebalancing. Accounts with over $100,000 get direct indexing, which is basically a more advanced version of tax-loss harvesting. Tax-saving features like these are particularly beneficial if you are investing a lot of money, but you don’t need to invest a lot to use Wealthfront’s services. The minimum to open an account is just $500. Wealthfront uses 11 asset classes and can arguably make a more diverse portfolio than TD Ameritrade Essential Portfolios can. Similar to Wealthfront, Betterment has a plan that charges an annual fee of 0.25%. This plan has no minimum investment and still gives you access to automatic rebalancing and tax-loss harvesting. Betterment also a plans with slightly higher fees (0.40%) that give you phone access to human advisors, however this plan requires a minimum investment of $100,000. If you can afford fees of 0.40% - 0.50% and you want access to human advisors, you could also consider Wealthsimple. There’s no minimum to start investing with Wealthsimple, your first $5,000 is managed for free and you also have access to human advisors through phone calls, texts or emails. Wealthsimple only offers tax-loss harvesting to accounts with at least $100,000 but it offers automatic rebalancing, auto-depositing and dividend reinvestment to everyone. An added feature with Wealthsimple is the option to invest only in ETFs that promote socially responsible companies. Bottom Line: Should You Use TD Ameritrade Essential Portfolios? The TD Ameritrade Essential Portfolios offers robo-advisor services from a reputable brokerage for a reasonable price. If you’re already a TD Ameritrade accountholder, Essential Portfolios is a great way for you to create an automated portfolio. An Essential Portfolios account gives you access to TD Ameritrade’s other trading services so it could be a good choice if you want to do other kinds of investing. Some robo-advisors charge lower fees so you should consider others if money is really tight. You should also consider others if you want to invest a lot of money in taxable accounts. This robo-advisor doesn’t use tax-loss harvesting or any advanced tax-cutting features. It's relatively new so it’s possible that more features will be added, but for now it is a bare-bones robo-advisor without much to differentiate it from its competition. Any time you make an investment decision, you should consider the tax implications. Not all robo-advisors focus on tax savings, so it’s a good idea for you to talk to a financial advisor who specializes in taxes. An advisor will help you navigate the tax code and maximize your savings. TD Ameritrade Essential Portfolios can help you to save money through a 529 college savings plan. If you’re unsure how to start saving for retirement, check out this guide to 529 plans.